Designs by Lisa Somerville: 24 Hours Left to SAVE! 24 Hours Left to SAVE! There's still time to save! Check out my savings through Cyber Monday! 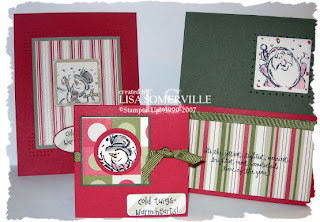 These cards were created with some pieces of the On Board Trimmings, left over from my Trim the Tree Class Kit. The last day to purchase the Trim the Tree Kit is November 30, email me to get yours! Don't forget to stock up on DSP and SAVE!